In my role as Director of Product Line Marketing for the spreadsheet division, I was involved in essentially all aspects of the companies marketing process from developing long-range forecasts and market share projections to picking colors for upgrade packaging. During my tenure at Lotus, a significant achievement was the creation of a seminar marketing function within the spreadsheet division arising from an organization shift in the field to end-user selling. In response to this shift, I put in place an objective to develop a benefits-oriented seminar that was to be given by all sales representatives as their primary sales tool. This goal was achieved within a six-week period over the Thanksgiving and Christmas holiday. People were pulled together representing all the major functions in marketing, sales, operations, and development with an external consultant who specialized in developing sales tools and presentations. With this team committed to making an aggressive (most said impossible) schedule we analyzed the strengths of our product vs. the competition and compared this to market research data on what users were concerned about and needed most. Based on this research we concluded and set as our goal that spreadsheet publishing was the position and theme we would “own” in the market as a result of this seminar. The Seminar was designed so that: a) We discussed the benefits of spreadsheet publishing; b) We provided live demos that provided tips and techniques that communicated key features in a benefits-oriented tone that taught the attendee how they could accomplish great results; and c) We conclude with specially designed application templates that showed the advanced power of the product in ways that most attendees could relate to in their organization. To back up the seminar claims an attendee kit was produced that consisted of a 24-page booklet on spreadsheet publishing from Lotus, sample output from major printers matching demo output of the seminar, a product brochure, and a welcome letter from Jim Manzi (CEO). Posters and banners were created to establish an identity and theme at each event which were synchronized with messages and icons used in materials handed out at the seminar. Backing this up was a direct mail campaign and advertising that was designed to be easily coordinated with local reseller participation and would maintain the theme and message of the overall event. All new ordering and logistical operations were created in manufacturing, order processing, and sales to support the activities of registration and confirmation of attendees across the U.S. and for supplying seminar materials to each event. We trained all the sales representatives and coordinators in the field and gave them seminar kits that contained slides, scripts, demo files, and logistical information on how to plan and conduct the seminar. This event was the first in Lotus history where all the components from customer handouts to advertising and PR were integrated behind a focused message, icon, and theme that remained consistent across the country. We delivered the first seminar on schedule on February 5th, 1991 and seminars across the country broke records for attendance and for getting high scores from customer and sales management. 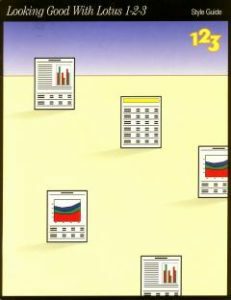 Customers walked away sold on the benefits of 1-2-3 Release 3.1 as the best product for spreadsheet publishing. A remarkable achievement considering the major competitor, Microsoft Excel, had a clear lead in this area at the time.